Canada's federal government watchdog is calling for the country's nuclear regulator to beef up inspections of the country's nuclear power plants. In a recent report, the commissioner of the environment found several serious issues. Ontario is proposing new rules for the bottled water industry. The move comes after a water bottling company outbid a small community in its attempt to buy a well to secure a water supply for its fast-growing population. An Ontario judge has dismissed a challenge to force the Cleveland Indians to change their name and logo. Cleveland is playing the Toronto Blue Jays in Major League Baseball's American League Championship Series. Two centuries after the British and United States squared off at the War of 1812 Battle of Queenston Heights, the Native American allies of the two sides were remembered Sunday as the Landscape of Nations was unveiled in Niagara-on-the-Lake. Mike Desmond was there for the first viewings of the Six Nations and Native Allies Commemorative Memorial. Canadian pot smokers barred for life from entering the U.S.
Canada's public safety minister says he will push the United States to change some of its border policies when it comes to marijuana. Some Canadians have been barred for life from entering the U.S. after admitting to American border guards that they have smoked marijuana in the past. Canada's largest city is having a rat problem, and it's growing. Pest control companies in Toronto are reporting a huge spike in the number of rat calls and the root cause of the increased numbers could be environmental. A southern Ontario county near the north shore of Lake Erie has an unusual problem and it's causing divisions among advocates for animal rights. As WBFO Canada correspondent Dan Karpenchuk reports, many are calling it a "cat-astrophe." Ontario has unrolled a new ad campaign highlighting the dangers of distracted driving. The message is: "It happens fast. Put down the phone." Recently, police in Toronto swooped into a downtown market area and raided dozens of so-called unregulated medical marijuana dispensaries. Nearly 100 people were arrested and more than 250 charges were laid. The raids have unleashed a storm of controversy. There is a new push underway in Ontario for a hotel tax, the latest call coming from the mayor of Niagara Falls. Any such tax would need the approval of the provincial government. Toronto's mayor has already had talks with the province and a hotel tax could be just months away. Ontario Premier Kathleen Wynne says critically ill people in the province can seek a doctor's help to end their life even before the federal government comes up with new legislation on assisted dying. It is an issue being watched on both sides of the Canadian-U.S. border. The roar of race car engines is still a couple years away. However, Fort Erie's mayor says some major announcements are expected very soon on the $300 million Canadian Motor Speedway project being developed. WBFO's Marian Hetherly talks the latest on the Canadian Motor Speedway with Fort Erie Wayne Redekop. A court ruling in Ontario could have wide implications for drivers across the country and in the United States. A judge has ruled that a common type of breathalyzer test is inaccurate. A recent study by anti-poverty groups in Toronto suggests the city is lurching toward a breakdown because of overcrowded homeless shelters. Activists say the city is failing to meet the basic requirements of its homeless population. Hundreds of mourners said their last goodbyes to former Toronto Mayor Rob Ford, who laid in repose Monday at the city hall he dominated for years. Ontario is backing the use of electric cars and it's offering incentives to people who buy them. Current subsidies, in effect since 2010, could, in many cases, double. TORONTO — The lawyer for an Ontario man arrested under an anti-terrorism law says it's not clear if his client will face any actual terrorist charges. As of Sunday afternoon, more than 17,000 customers in Southern Ontario were still waiting for Hydro One and PowerStream crews to restore their electricity. The family of Rob Ford has posted a video tribute to the former Toronto mayor that features clips of supporters hugging him to the tune of Puff Daddy's music. Toronto's most famous mayor has died. 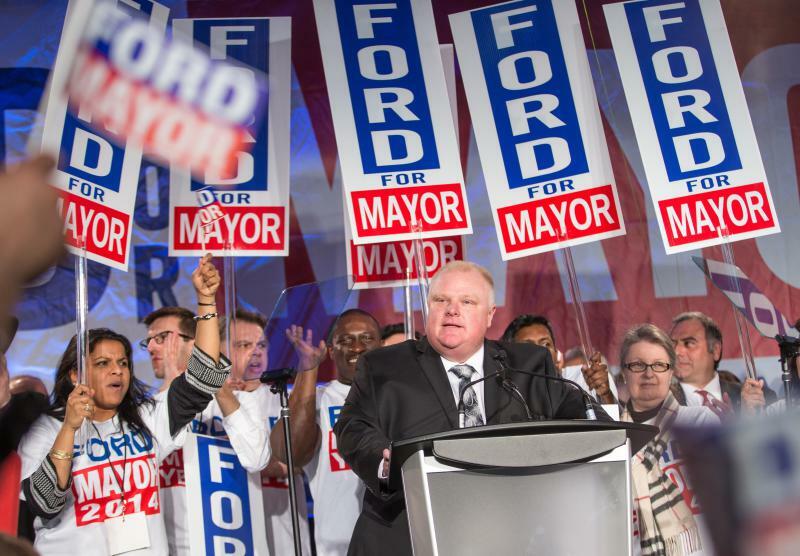 Rob Ford passed away this/Tuesday morning after losing his battle with a rare form of cancer. The former mayor made headlines around the world with his controversial admission of having used crack cocaine. Rob Ford, the former Toronto mayor whose drug-addled fall from grace made international news, has died. Ford had been fighting cancer since 2014. In a statement, his family said he died earlier today at age 46. "A dedicated man of the people, Councillor Ford spent his life serving the citizens of Toronto," the family said in a statement. There is a new push for Toronto to have safe injection sites and it's coming from the city's chief medical officer of health. But before it can get federal approval, there must be a consultation process in the communities where sites are proposed. TORONTO — Ontario's police watchdog is investigating a fatal shooting involving Toronto police. More than six months after a report called for action to protect and clean up the Great Lakes, very little has changed. That's the assessment of the Canadian Environmental Law Association. A recent report warned of another poor year for maple syrup producers in Canada and the northeastern U.S., but some producers in Ontario aren't so sure. Toronto (CP) — Chief Medical Officer of Health Doctor David Williams says a person who travelled to Colombia has tested positive for the Zika virus. ONTARIO (CP) — Provincial Finance Minister Charles Sousa says most of the jobs being created in Ontario are good paying, full-time positions. It's an election year and, as often is the case, healthcare is a high political priority. That inevitably leads to a comparison of healthcare between the U.S. and Canada, where universal government-funded healthcare has been around for more than half a century. WBFO Canada correspondent Dan Karpenchuk has more on one upstate New York doctor who moved north.